This classically inspired, rococo style frontispiece gracing French tragedian, Prosper Jolyot de Crébillon’s (1674-1762) Oeuvres, was designed and drawn by artist François Boucher (1703-70). Boucher was ‘First Painter to the King’ – Louis XV (1710-74), and although Boucher was a trained engraver the image for the book was carved by Jacque Phillipe LeBas (1707-83). LeBas also worked within the King’s artistic ‘stable’ – Le Cabinet du Roy – and was one of the most sought after graveurs in mid-17th century Paris. The bust on the plinth in the image depicts the author, Crébillon, and despite the fact he wrote tragedies, the scene surrounding him looks almost idyllic. 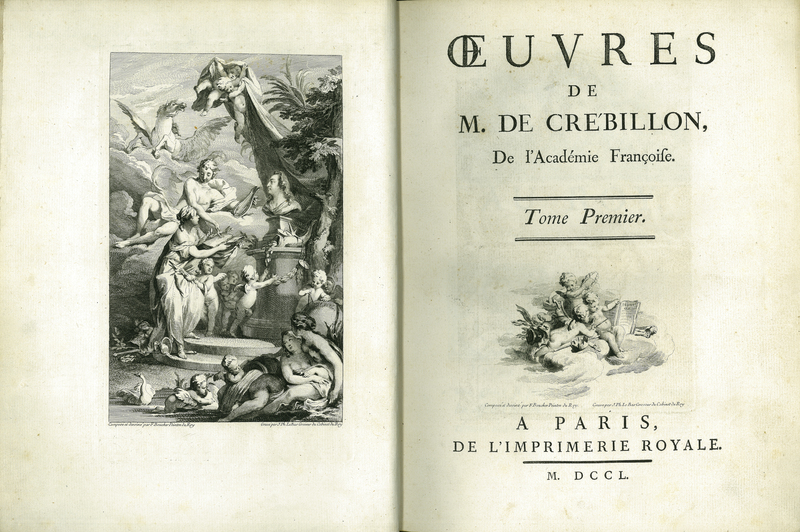 ___, “Oeuvres de M. de Crébillon, de l’Académie Françoise. Vol. I,” ourheritage.ac.nz | OUR Heritage, accessed April 26, 2019, http://ourheritage.ac.nz/items/show/10714.